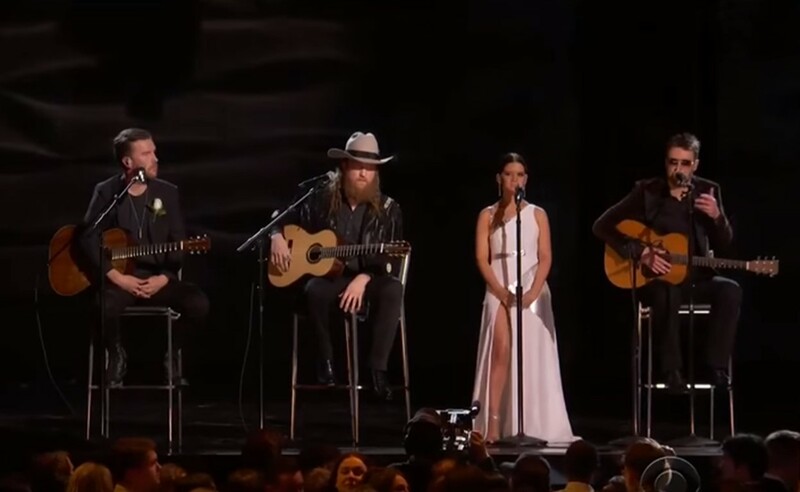 2018 Grammy Awards: Country Artists Pay Tribute with "Tears In Heaven"
During the 2018 Grammy Awards, Eric Church, Maren Morris, and Brothers Osborne performed "Tears In Heaven" in honor of the Route 91 victims. As promised, the 2018 Grammy Awards ceremony included a heartfelt tribute to the victims of the Route 91 Harvest Festival mass shooting. Country music stars Eric Church, Maren Morris, and Brothers Osborne tooks the stage to honor the 58 individuals who were killed during the senseless violent act. As fans may recall, Church headlined the first night of the popular Las Vegas music festival, which was also the closing night of his tour. “On Oct. 1, all of country music was reminded in the most tragic way, the connection we share with our fans, and the healing power music will always provide,” T.J. Osborne told the audience before the music started. Watch the country music artists cover Eric Clapton’s “Tears In Heaven” below! Goodness. What an emotional tribute. Brothers Osborne were nominated for ‘Best Country Duo/Group Performance’ for “It Ain’t My Fault” and Maren Morris was nominated for ‘Best Country Solo Performance’ for “I Could Use a Love Song.” Neither won in their respective category, but their tribute certianly made a lasting impression. Share this performance with other country music fans.